Veteran archer Alison Williamson will not bid for a record-breaking seventh Olympic appearance in Rio after deciding to retire from the sport. 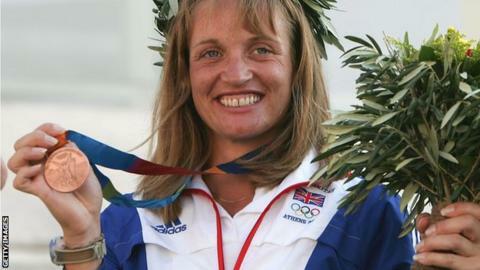 Williamson, 42, made her Team GB debut at the 1992 Barcelona Games and won bronze at the 2004 Athens Olympics. "It has been an amazing journey," said Williamson, a primary school teacher. "But I just can't continue to dedicate the hours that are needed any more." Athlete Tessa Sanderson and fencer Bill Hoskyns also competed at six Games. Williamson considered retiring in 2008 after missing out on adding to her medal collection at the Beijing Olympics. However, she decided to continue and claimed both individual and team Commonwealth silver medals in Delhi 2010. She was awarded an MBE for services to archery in 2012. With the sport dropped from the programme for Glasgow 2014, Williamson, who teaches in Stafford,- revealed after London 2012 that she would take time out from competitive archery before deciding whether to commit to the Rio 2016 Olympic campaign. "I put my teaching career on hold to represent my country at various events across the globe and now the time is right to just concentrate on the day job," said the recurve bow specialist. ArcheryGB performance director Sara Symington, herself a two-time Olympic cyclist, praised the role Williamson has played in boosting the profile of archery. "Alison's contribution to the sport of archery cannot be overstated having competed at the highest level of archery for more than 20 years," she told BBC Sport. Williamson wants to remain involved with archery, hoping to introduce youngsters to the sport as well as promote Olympic values. "Archery is a fantastic activity and that is why I still love being a part of it," she said.